There's a certain energy on board flights to Fiji - happy holidaymakers as loud as their shirts, kids finally switching off from their screens and flight attendants serving out a sneaky extra bottle of wine or two. Leave your cares at the departure gate, for there is no place for them in Fiji. Even an unlucky delay at Fiji's Nadi Airport isn't so unlucky, offering an extra glimpse of the island's gorgeous, glittering coastline. Arriving at your resort you'll be greeted by burly blokes yelling Bula! However don't be alarmed, in fact you might as well just go ahead and get used to it, as it's a performance that will be repeated every few minutes throughout your entire stay. It actually becomes quite reassuring and don't be surprised if you find yourself starting to follow suit as you pass fellow guests in the halls. 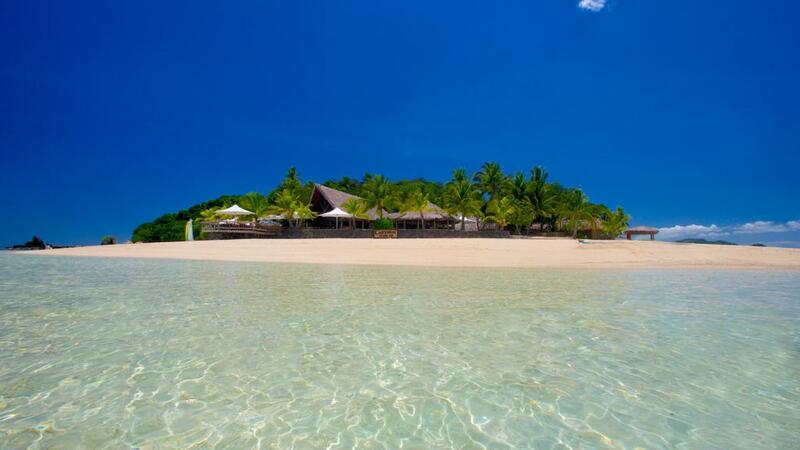 Such is the magic of idyllic Fiji. Even staying in five star resorts with first class service doesn't make you immune to the Bula bug. 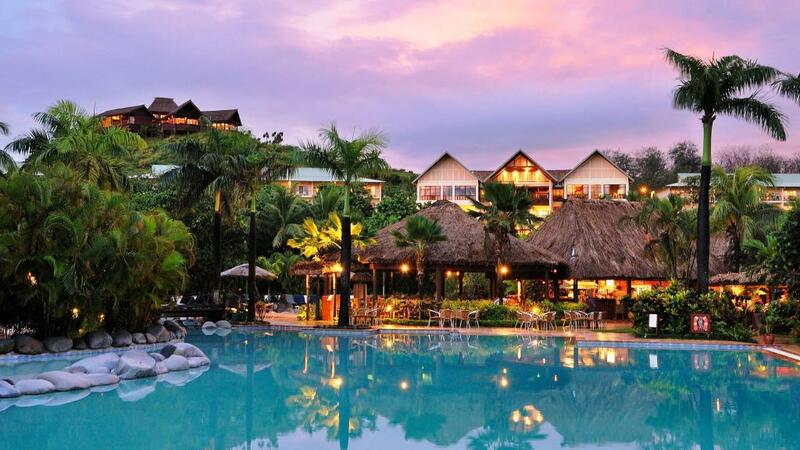 Fiji's effervescence is pervading, with luxe resorts such as the Coral Coast's Outrigger Fiji Beach Resort offering all the creature comforts, while retaining its traditional roots, fashioned to look like an authentic Fijian village. It's not all buffets and cocktails (unless of course you want it to be), the resort offering an outreach program which is proving to be extremely popular with guests. Combine karma and kava by visiting a local school and help fellow guests and community workers to spruce up the place, building bures or giving schools, villages and community halls a lick of paint. Your efforts, along with books, stationery and other gifts, are so appreciated and a kava ceremony will be conducted in your honour. The national drink of Fiji, kava is made by mixing the powdered root of the plant with water. The murky appearance and spicy, earthy flavour can take some getting used to but its mild numbing effect feels strangely, blissfully familiar. For some cute kids and otherworldly voices, visit a local church. Or for something a little more hands on, join a cooking class at the resort under the expert guidance of the multi-award-winning chefs. Don't miss a visit to the spa sanctuary either, perched atop the hill, you'll experience pampering of the highest degree while enjoying views high above the ocean. Guaranteed you've never experience relaxation like this. If you're looking for a more secluded stay, Castaway Island in the Mamanuca group promises everything its name suggests and more. A tropical island paradise, Castaway is an oasis situated on a splice of soft white sand surrounded by lush jungle that rises out of the Pacific. Upon arriving on its shores, the friendly staff of Castaway Island greet you on the beach, barefoot and serenading you with guitar and song. When you're done drooling over the scenery (as if) you can head over on Modriki Island for the true Castaway experience, for it was on this island where Robert Zemeckis and Tom Hanks filmed Cast Away. Snorkel the crystal waters, relax with a picnic on the deserted island or enjoy a liquid lunch of champagne as you gaze across the water. Your days will be filled with sleep ins and lazy mornings grazing the impressive breakfast buffet before returning to the sirens song of swimming and snorkelling in the pristine waters off Castaway. There are plenty of activities on offer at the resort, however it's pretty hard to get tired of the relaxed beachcomber lifestyle at Castaway. Not matter how you decide to spend your days, be sure to indulge in a sunset cruise. As you head out to see sipping champagne and nibbling on cheese, accompanied by the sweet sounds of an island crooner, the sky explodes in a riot of pastel and neon pinks, golds and lilacs. You'll notice the chatter of your fellow cruisers die away quickly as you all admire the spectacle in silence. As the moon rises, side by side with the sun, your boat turns lazily, sun slowly dropping in the sky, and heads back toward the island, racing the dark all the way back to the beach.